Come on. Anything cheesy inside a crispy shell is automatically irresistible. And you're probably going to eat too many of them. That's why you should make this easy recipe for baked jalapeño poppers. The breadcrumbs give you the same satisfying crunch but the peppers aren't fried so you won't feel that bad having five (or 10) of them. Baking the poppers is also much easier and definitely less messy than frying. The lime-yogurt dip is perfect for cooling off any chiles that are too hot to handle. Want to crank up the heat? The white membranes inside chile peppers and the seeds carry most of the spice. Leave some in to get more intensity from your chiles. Per Serving: 252 calories; 19g fat; 11.1g carbohydrates; 10g protein; 54mg cholesterol; 391mg sodium. I actually like this better than fried jalapeno poppers, because the pepper keeps some crunch which is really nice and tasty. Not too spicy at all. Yum! What a great simple appetizer to make! I could eat this all day. I will definitely keep the seeds in next time to make it extra hot. Can't wait to make this again. These jalapeño poppers were so good! They weren't as greasy as the ones you'll find at a fast food joint or restaurant. 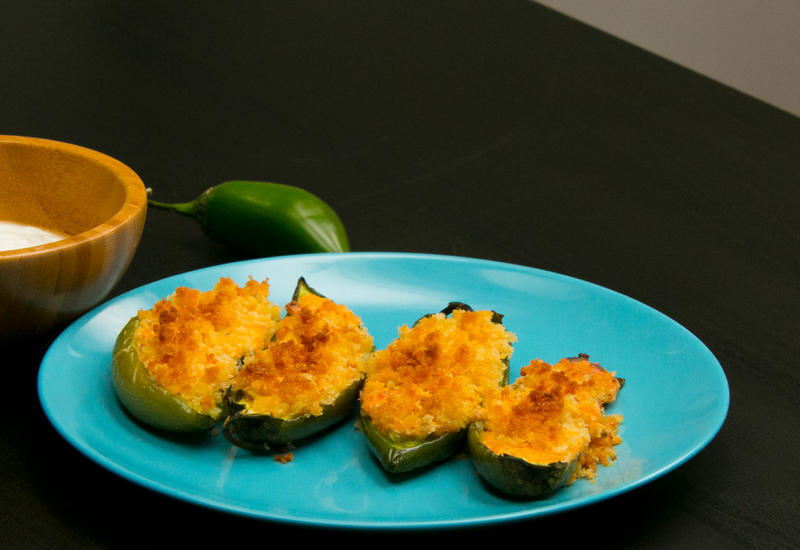 If you love jalapeños and cheese, you will LOVE this recipe. The yogurt dip was unique, and actually helped my taste buds tolerate the heat of the peppers. Definitely going to make this at our next game day party! I've been on a cream cheese kick lately, and am obsessed with this recipe. I kinda went overboard so I also added feta cheese too. Such a cheese addict! I can't wait to make these again. I used a Cajun spice seasoning instead of cayenne and it was really delicious. The texture of these poppers are great, even though it's baked. I used sour cream instead of the yogurt for dipping, it paired well with it.